It started in 1904 with the natural goodness of malt and milk. Today, Ovaltine is a household name that kids (and adults!) love. 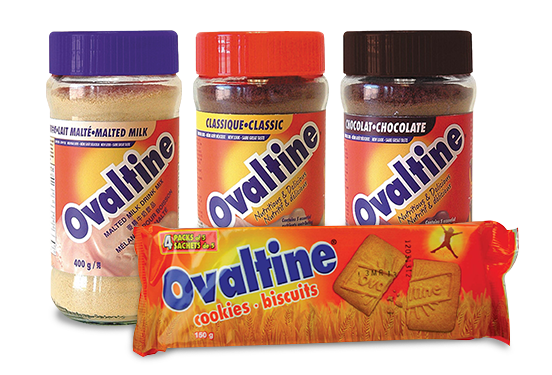 Ovaltine provides 12 essential vitamins and minerals with no artificial flavours or sweeteners. Moreover, Ovaltine has less than half the sugar of the leading chocolate syrup brand. 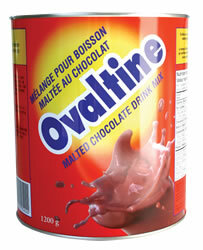 Ovaltine also makes a great addition to smoothies, baked goods or sprinkled over ice cream! Dunk me in delicious Ovaltine!’ If you love Ovaltine, you will LOVE these cookies. Enriched wheat flour [wheat flour, niacin, iron, thiamine mononitrate (vitamin B1), riboflavin ( vitamin B2), folic acid], sugar, vegetable shortening [cottonseed &/or canola &/or palm oil], ovaltine malt drink mix [ barley and malt extract, skimmed milk powder, fat reduced cocoa, whey powder, glucose syrup, egg, vegetable oil (coconut &/or palm), magnesium carbonate, salt,vanillin flavour], skimmed milk powder, honey, corn starch, salt, leavening agens (ammonium bicarbonate, sodium bicarbonate), artificial vanilla flavour, coloured with beta carotene. Barley and malt extract, sugar, cocoa powder, whey powder, modified palm oil (medium chain triglycerides), magnesium carbonate, salt, absorbic acid (vitamin C), iron phosphate, vanillin, naicinamide, vitamin A acetate, maltodextrin, thiamine hydrochloride. Contains: milk, barley. Malt extract, whole milk powder, whey powder, sugar, palm oil, butter oil, oligofructose, sodium bicarbonate, salt. Barley and malt extract, skim milk powder, cocoa powder, whey powder, glucose syrup, modified palm oil (medium chain triglycerides), salt, magnesium carbonate, vanillin, iron phosphate, naicinamide, vitamin A acetate, thiamine nitrate, absorbic acid (vitamin C).